It was time to throw a party. Mia, my 8-year old daughter Ava’s American Girl Doll, was turning 4. Ava had been obsessing about this party since Christmas – even more so than her own birthday party, although that wasn’t until June. On ventures to the Mall of America, she’d beg, just one more visit to the the American Girl store? Mia really needs some new shoes. I pressed her, Really? I decided that there should be no harm in letting her spend her hard-earned money (received by way of birthday and holiday cards, actually) on gifts for a doll. Super practical! In looking for the larger meaning here, I agreed, Yes, Mia did need some new shoes. She also needs someone to stress about hosting the perfect birthday party – inviting the guests, making the food and drink, decorating and finding activities to keep the guests entertained. Don’t forget the party favors! She will certainly appreciate my eight-years worth of effort in planning her birthday parties, all hosted at our house, when she’s through with Mia’s party. I got out a box of mish-mashed decor from the years and she set out on the task. 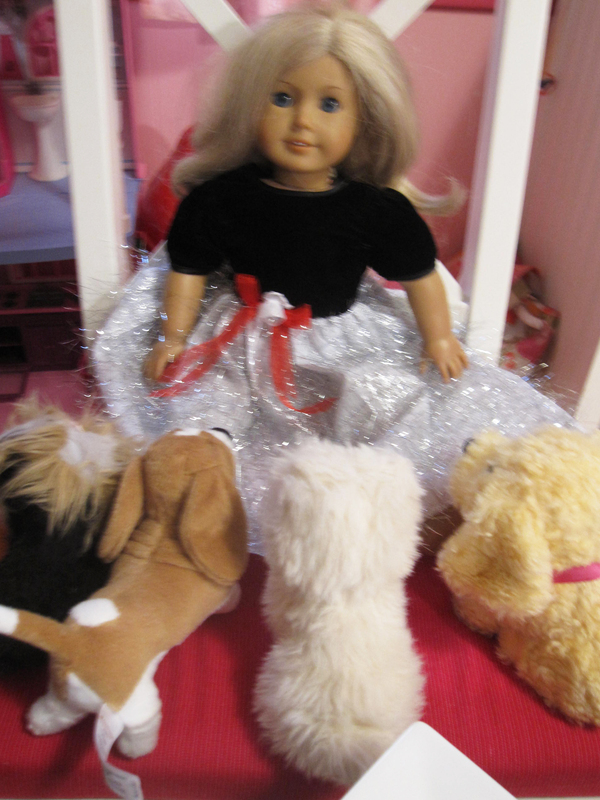 She invited one special cousin, Ravelle, and two of her American Girls to join Mia and Ava’s other American Girl doll, Piper. That’s a tally of six. For this party, Ava chose to invite her cousin AND make her help with the cake prep and serving work. …hmmmm, I could take a lesson from this. 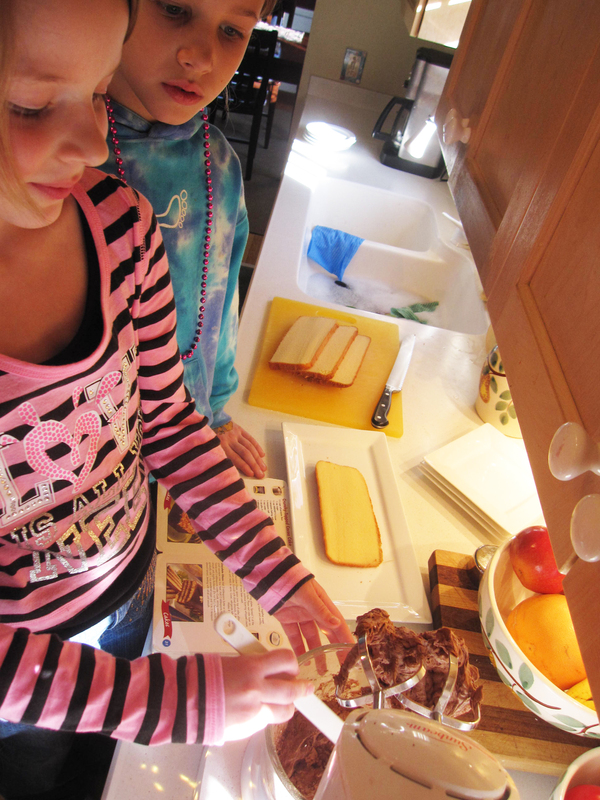 The two of them made a simple cake Ava picked out from a Hersey’s dessert book she had checked out from the library. Thanks to SaraLee’s pound cake, the cake part was a wrap. It was more about the filling between the 4 layers and the whipped chocolate topping. The girls added ingredients and I supervised the mixing. Then it was time to frost – patience, wrist movement and correct depth of frosting were attempted and averagely executed. Ravelle mentioned her previous sessions with her Grandma, an excellent cake baker and decorator. We all agreed, frosting was a skill to keep trying to perfect. After the frosting, seemingly the glue for the cake layers, was to their liking, their eyes lit up at the prospect of what to do with the mixer beaters and spatulas with all that unused frosting. 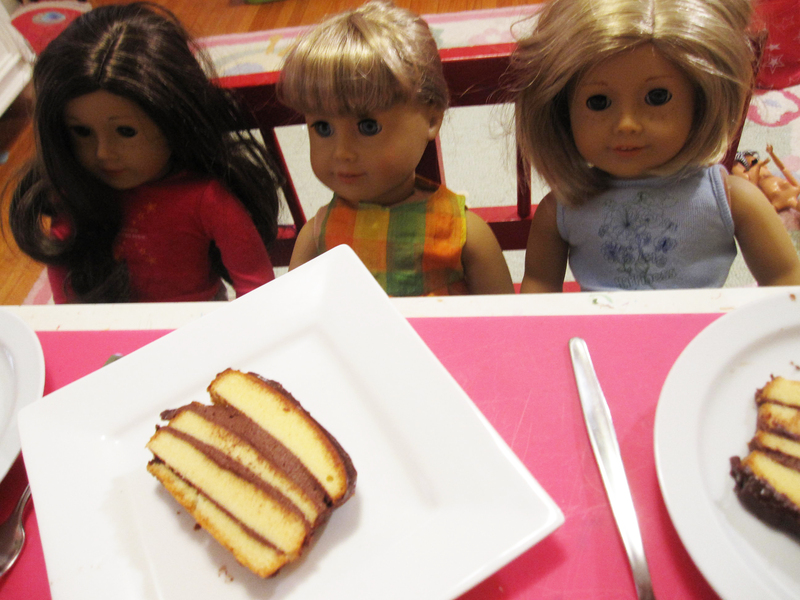 Later, with that task licked, they were ready to serve cake to the party guests and guest of honor. The AG dolls behaved themselves as they silently joined us in the H B D song. The AG cats and dogs, although panting over the layer cake, also acted appropriately. Mia glowed on her birthday, in her new birthday dress with those shoes her “mom” just had to have for her. I was surprised at how this simple gesture for a doll brought Ava so much pleasure. Reminded me of why I, and all of us parents, go to the trouble. Happy Birthday, Mia! Whether you represent the tortoise or the hare, it’s no matter at a young age. Running is fun. It’s when you turn six that it really matters. 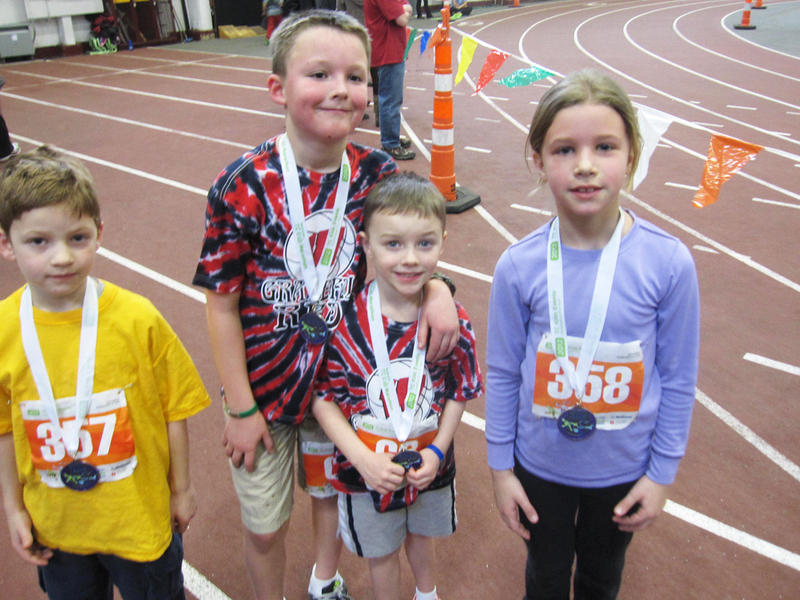 A few weekends ago my kids – ages 6 and 8 – ran in the Twin Cities Medtronic run – The Fieldhouse Fun Run – on Saturday, February 4. Tortoise + Hare: Friends or Foes? Our friends and their kids (Ethan and Andrew) were planning on going. My daughter, Ava (8), had run in two annual TC Medtronic races on the first weekend in October – first a half mile, then a mile. She knew the uphill terrain of the course and outdoor environment. What I liked about this race was that it took place indoors on a track, giving them exposure to a more consistently flat elevation, and it introduced the concept of staggered starts and pace. I pre-registered both kids ($12 each) – Ava for the mile (8 laps) and Calvin (6) for the half-mile. I swear we discussed this weeks ago. We also talked about it the night prior to the race. Yet, race day morning, Ava was NOT going to participate. She hadn’t trained for it. That pushback caught me off-guard, but I had to admire it. She was serious about running. After conveying a lot of blame and anger my direction, it finally sank in that she had the option to run or not to run. I was not going to force her. I packed her running gear on the sly and we headed out 8:30a.m.-ish. 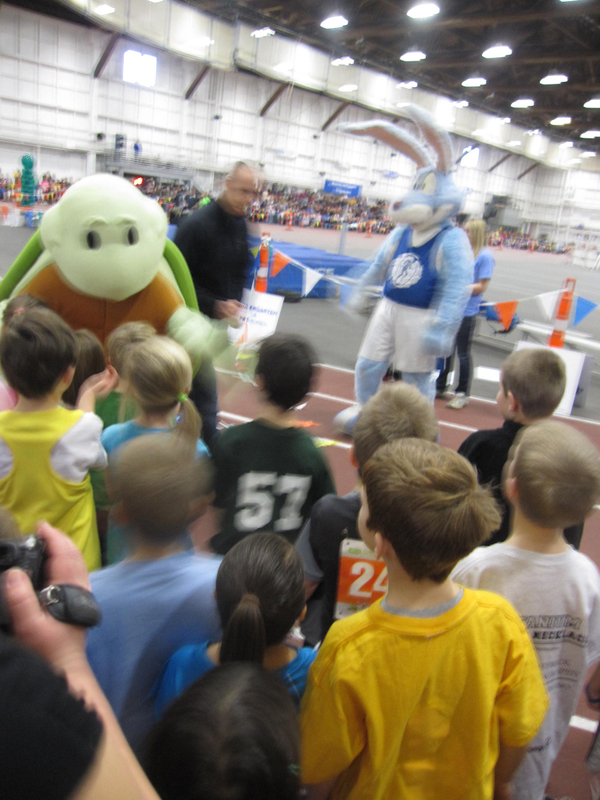 Shelly and Hairy, the tortoise and the hare respectively, started the day out with their own comedic half-a-lap race. As the story goes the tortoise remained focus and steady, while the hare goofed off and ran circles around him. Of course, they tied at the finish and kids cheered. It was kind of a cluster (see video) at the start. Instead of one kid per each one of eight lanes, about 50 of them started together. Ava had coached Calvin earlier to pace himself and he nodded, taking in her advice (he was a novice runner). That immediately went by the wayside as he sprinted right out of the gates into the pole position. The older kids in the group of 4-6-yr-olds passed up the young ones. It got confusing. I had to flag Calvin in after his 4 laps and none of the field crew seemed to understand what was happening. I think he was 4th. We don’t know. Then several more races took place. Finally Ava warmed up to the idea of running and got her gear on. An instructor of some sort warmed them up prior to the race. The third graders were finally off and running. Ava also disregarded her own advice and began with a bit of a sprint right off the bat. Later she said that hanging back with the crowd really doesn’t get you anywhere. She should know. She held her own and I think finished second for girls in her race. The whole event was a social hour for parents too – we met our friends there with their two boys who were each in the same races as our kids. I wanted to do some sprints – now THAT could be a fun event. The only things missing were donuts and coffee. Some parents were dragging. It was 10:45a.m. The kids were starved from their races and parents were decaffeinated. We debated, considered and settled on brunch at Hell’s Kitchen. Reward for a job well done. As a runner – long distance and the 800meter – I had visions of track stars in my head. Us parents always have to go there, don’t we? I try to stay in the moment and accept that I do not know where their passions will take them. I can guide them, but cannot predict nor dictate. Tortoise or hare, it’s all about the journey. As adults, we’re expected to set and meet goals. You don’t just wake up with this innate sense of drive and the motivation to accomplish, nor is it handed to you when you graduate highschool. I have parent envy for those who begin teaching their children at an early age consistently how to set and meet goals. I could do better. Typically the goals in younger years are a duality of parents incenting kids to meet daily or frequent must-dos, while the kids are simply driven by the end reward. Example: Brush your teeth every day, kids, and you’ll get a reward, like a sticker, at the end of the week. I actually like this example because even though it’s end reward is nominal, the reward doesn’t come until the end of week. Mine goal/reward propositions tend to be a bit more immediate gratification-like, which can be effective but may also backfire when they start lobbying you for rewards for every little thing they are supposed to do without question. My kids at 6 and 8 might have some catching up to do. I struggle with having to incent them to do daily tasks. I’d rather just say, “Fine don’t brush. It’s you and your placque-covered teeth at your next dentist visit.” I’ve tried to be creative – – selling them on the fact that the activity I’m pushing them to do is SO much fun whether it’s teeth-brushing or washing dishes. They are on to me. In hindsight, I can see where their association with the goal/reward process, no matter how counterintuitive enforcing it may seem, is a stepping stone for larger things. All is not lost. 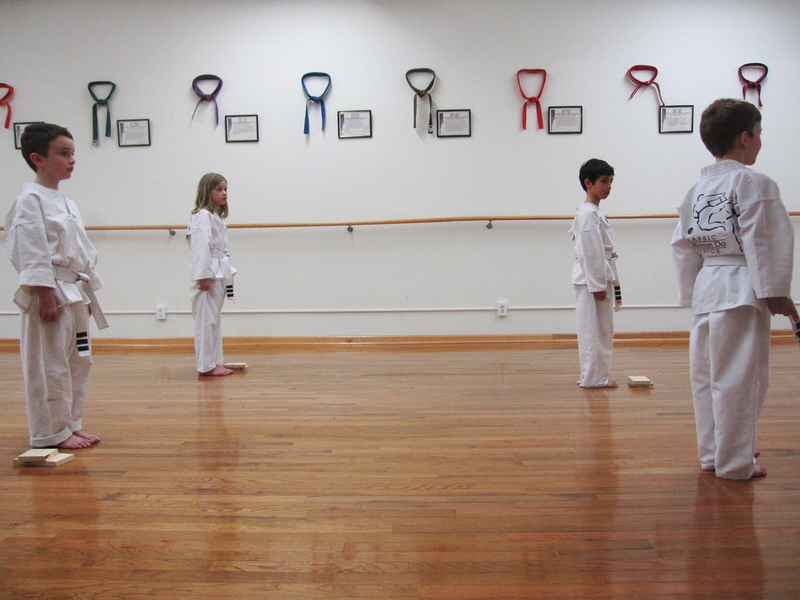 As mentioned, we’re not into rewarding them for every little thing they do, but at ages 6 (Calvin) and 8 (Ava), my kids recently surprised me by what they had learned through their TaeKwonDo practice. They did daily lessons all summer as part of a day camp, then continued on, twice a week when school started. They’ve participated in a gamut of sports from team to individual, each with their valuable lessons. The noticeable difference TaeKwonDo brought was a focused connection between mind and body – – the power behind a swift kick, the element of self defense, the importance of a repetitive, specific movement to achieve a result and the follow-up of moving on to the next belt level after a mastery of required skills is reached. The highlight for me is the follow-up after the physical portion which quizzes each child on some basics and prompts them to answer how they felt before testing – scared, nervous, anxious, doubtful – and after testing – proud, confident, satisfied. 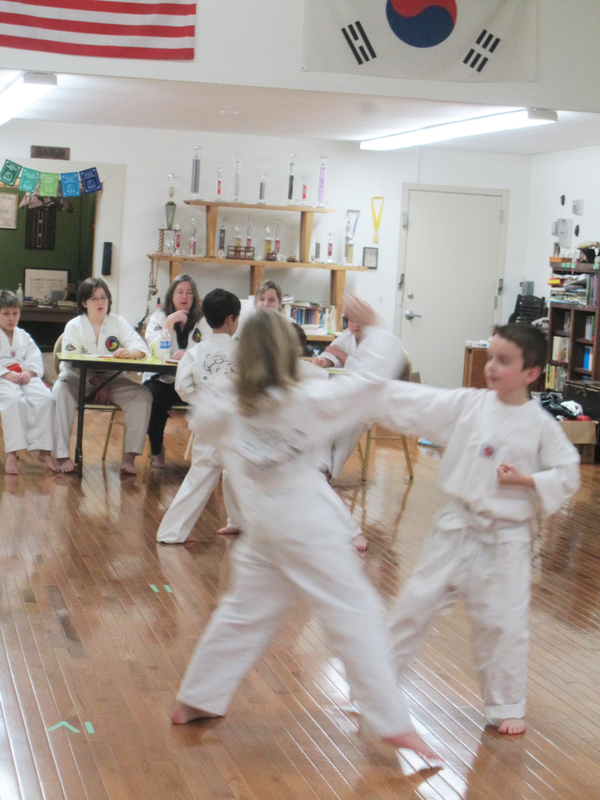 The instructor and owner of Classic TaeKwonDo Studios, Carolyn Boston, paralleled the practice to some daily situations kids could relate to and also encouraged them to channel the right attitude about applying themselves in all aspects of their lives to make things happen. There are other types of practice that evoke this same sense of discipline, most certainly. What other sports and activities do your kids do? What are some meaningful ways to have them set goals with appropriate rewards?